This last weekend, Willy Paul, Size 8, Dj Mo, Hopekid, Dk Kwenye Beat, Benachi, Mc Price, Saint Stevoh among other celebrated gospel artistes, were on the road to Njiiri’s High School all set to entertain the students with powerful performances. After their performances, the score of entertainers hit the road to return to Nairobi and it is at this time when they decided to be creative with their camera during the journey. 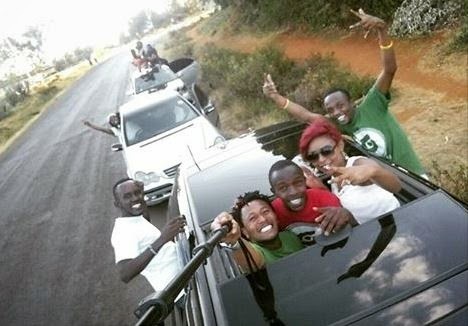 While en route to the big city, the artistes led by System Unit’s Dj Mo decided to take a groufie on top of the cars they were traveling in.